The highest peak in the New England, Mt. Washington is home to perhaps the premier Northeast backcountry ski destination, Tuckerman Ravine. 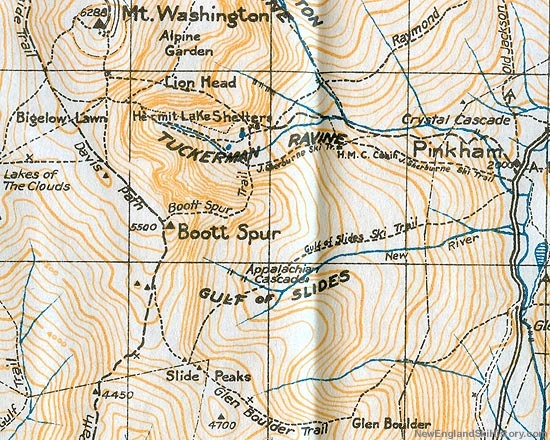 The CCC cut the Gulf of Slides Ski Trail in 1935, running from Pinkham Notch to the Gulf of Slides (located below Gulf/Slide Peak and Boott Spur). The John Sherburne Ski Trail was cut in 1934 to provide a designated way down from Tuckerman Ravine, freeing up the lower Tuckerman Ravine Trail to uphill foot traffic. There is no known CCC involvement in the designing or cutting of this trail.
" The new Gulf of Slides Ski Trail in Pinkham Notch is fast nearing completion and the Peabody CCC camp has approval by the Foresters of two projects that will benefit the skiers in this region. One is a ten acre clearing for ski practice on the side of Wildcat mountain about one-quarter mile from the AMC camp, off the Pinkham Notch Trail, and the second is a new forty foot bridge across the Cutler River at the bottom of the Tuckerman Ski Trail. " " Gulf of Slides Trail (W.M.N.F.). Starts from State 16 at Pinkham Notch Camp. Length 2.5 m. Max. grade 20º. Easy trail leading to Gulf of Slides - a large above-tree-line practice area with skiing comparable to that in Tuckerman Ravine. John Sherburne Trail (W.M.N.F.). Starts from State 16 at Pinkham Notch Camp. length 2.5 m. to floor of Ravine. Max. grade 25º. Trail cut through to tree line in Tuckerman Ravine. Ground is smooth, cut amply wide, and is a suitable downhill run for all classes. 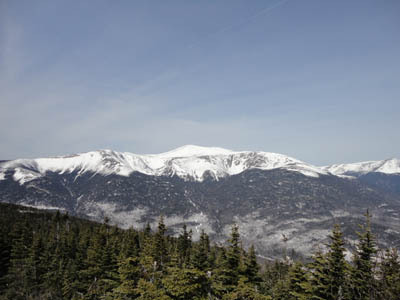 It is best to use the Tuckerman Ravine Trail for climbing, as the grade is more even than the ski trail and two public cabins (W.M.N.F.) temporarily provide for daytime shelter below Hermit Lake. " " John Sherburne Ski Trail, (WMNF) constructed in 1934, fulfilled the need for an adequate ski trail from Tuckerman Ravine to Pinkham Notch Camp. It is named for the lake John H. Sherburne, Jr., largely through whose efforts, as a member of the U.S. Eastern Amateur Ski Association classification committee, this trail was realized. It leaves the Pinkham Notch Road about 200 ft. S of the Camp and ascends to the little head-wall by a zigzag course, keeping at all times to the L (S) of the Tuckerman Ravine Path and the Cutler River and skirting the spur ridge just below the Harvard Mountaineering Club cabin. From the top of the little head-wall to the floor of the ravine the trail lies on the N of the stream. It is 10 to 50 ft. wide. The slope is such as to make it suitable for expert and intermediate skiers at some points but it can be negotiated by novices, because of its width. There should be 15 in. of packed snow for good skiing. " " Gulf of Slides Trail, (WMNF) a wide trail, requiring 12 in. of packed snow for good skiing, leaves the Pinkham Notch Road about 100 yds. 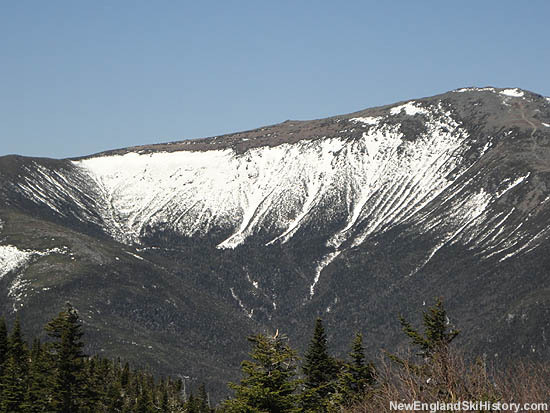 S of Pinkham Notch Camp and ascends to the W 2,200 ft. in 2 � m. to the bowl of the Gulf of Slides. A short distance from the highway a branch trail to the R crosses two branches of the Cutler River and joins the John Sherburne Ski Trail near the camp garage. " " In 1935, master trail designer Charlie Proctor laid out the Gulf of Slides Ski Trail from Pinkham Notch, following the north bank of the New River into the Gulf. The trail was cut the same year by the Civilian Conservation Corps, and it has been maintained as a ski trail ever since. " "New Hampshire Notes." American Ski Annual. 1935-1936. New Hampshire Skiing. Concord, NH: State Planning and Development Commission, 1934.